Today I need to start with applying interfacing, transferring pattern markings and stay stitching. Another tip, while I'm stating the obvious, is make sure the glue side of your iron-on interfacing is facing the wrong side of your fabric. 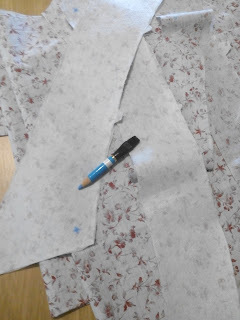 Trying to peel off interfacing from your ironing board cover is a waste of time, patience and interfacing. I can't be the only one who's done this, surely. As you can see I have used a chalk pencil, which you can sharpen with a normal pencil sharpener. I mark the dots on a pattern with crosses, so that I have more chance of finding them. For most pattern pieces the fabric is folded in two so you cut both sides at once. To mark the top piece, make a hole in the pattern at the dot or line and draw through it. To mark the other piece, stick a pin through the dot or along the line and mark the fabric where the pin appears on the under side. 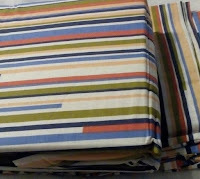 Before we sew anything, take a scrap piece of fabric and check that your machine is at the right setting for your fabric. Boring I know but it's best not to find out that your machine is going to chew your fabric when you are trying to sew a piece of your garment. Again, the voice of experience! On to stay stitching the neck edges. This is done using a straight stitch within the seam allowance and helps the neck to hold it's shape. A lot of fiddling is required around the neck and, as it doesn't follow the grain of the fabric, it can easily get distorted. Then the darts. (I am missing out the front waistline darts on account of having lost my waistline somewhere.) The darts in this pattern are straight lines between the dots so using a ruler to mark the lines between the dots would make life easier. Or I could just live dangerously and do it by eye! It's hard to guide fabric with your fingers crossed, but here goes! That went well. Some people just choose unpicking over line drawing. Press the bust darts down and the waistline darts towards the middle. I don't know if you can see that very well in the photo but it is a dart. Now the shoulder seams and side seams. I would normally use 5/8ths of an inch as a seam measurement, my sewing machine insists on 1.5cms. I bow to it's superior knowledge and all is well. Now I have a garment shaped article. Press the seams open, you will never have such easy access to the seams again, so press away! We have completed steps 1 to 5 (not necessarily in the stated order) of the pattern instructions. Hurrah! Meet Diana (who's been legless since Christmas!). She isn't my size so doesn't fill my garments as I would but now that it has some shape this seems the best way to photograph it. Talking of access to seams I now have a decision to make. Edge finishing is required to stop fraying and should be done now as access to these seams will be tricky once more seams have been added. Do I use one of the sewing machine options or the overlocker? The second option gives a more professional look BUT I will need to re-thread it with white thread AND if things go wrong they will go seriously wrong. In true Mrs Blob style I have decided to put off the decision and move onto the collar (step 6). Sewing along the seams and trimming is the easy bit. Turning it right-side-round is tricky. Good trimming is worth the time but the most useful thing I have for just such a task is my wooden letter opener! This was bought for me by my mother for this precise purpose and is wonderful. Made by a lady called Sue Palmer. Now for the topstitching. This is straight forward until you come to the points of the collar. These are too narrow for the sewing machine's teeth to grab and so the collar will come to a dead stop and make a mess. My tip for this (tip! See what I did there..?) is to stitch a long piece of thread to each point, long enough to wrap around your finger and grab hold of. When you turn the corner at the point and try to stitch away from it, move the fabric by pulling on the thread - taking the job of the feeder teeth. When it's job is done, just cut the thread free. I have had enough for today. The next collar step is tricky.